A big step forward for the former king of glitch plugins, although the loss of some of v1's functionality irks a little. High quality effect modules. New Distortion module is amazing. Some v1 features missing. No presets. Fixed effects routing. Can't bypass effects modules. No swing timing. 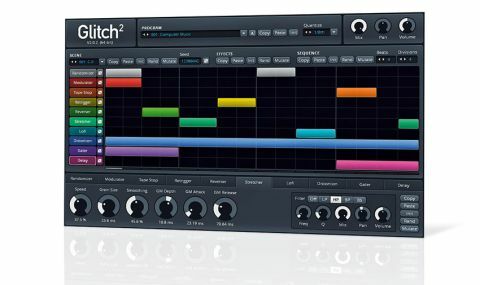 The original Glitch was a hugely popular free plugin boasting nine wacky effects modules that could be sequenced to perform an energetic chain of mutations - "glitches", if you will. Available only in Windows VST format, it gave us the means to spice up loops, build climactic transitions and generally transform mundane sounds into exciting ear candy. Glitch 2 is Illformed's commercial sequel, now also available in VST/AU formats for Mac OS X and VST for Linux, in 32- and 64-bit versions on all platforms. "Glitch 2 is capable of triggering any combination of its effects simultaneously"
The first thing that original Glitch users will notice is that the interface now has one lane for each module, similar to Sugar Bytes' Effectrix, making Glitch 2 capable of triggering any combination of its effects simultaneously (their routing, which flows in series from top to bottom, can't be changed, unfortunately). To be clear, though: Glitch 2 is not an Effectrix clone. If anything, Effectrix borrowed many of its design features from the original Glitch, and Glitch 2 has its own sound and a very different set of modules to Effectrix. In our opinion, Glitch 2 has the best interface of all the various glitching plugins currently available. The multi-lane sequencer is quick and easy to manipulate - you can even move sequence blocks vertically between the effect lanes. The sequencing engine seems to respond faster than the competition, too - never sloppily chopping off the front of the next hit in a sequence, for example - and the effects themselves are of the highest quality. In fact, most of the modules are good enough to produce decent and varied glitches on their own, so in combination they're truly formidable! Each Program stores 128 Scenes, each with its own sequencer pattern, timing and effects settings. Annoyingly, although the Scenes can be triggered via MIDI notes, Glitch 2 doesn't have the MIDI learn capabilities of the original Glitch plugin, so you'll have to use your host DAW's automation system if you're looking to perform filter sweeps and the like. Each module now has a Randomise function to conjure completely new settings from thin air, and a Mutate function for making slight variations on current settings. There are also per-lane Randomise buttons for generating sequencer patterns. Furthermore, each module comes with a resonant multimode filter as well as pan, mix and volume controls. "While Glitch 2 generally makes a good follow-up to the original, it doesn't necessarily replace it"
While Glitch 2 generally makes a good follow-up to the original, it doesn't necessarily replace it. For example, the Modulator module lacks the Spread (for stereo width) and pitch controls (for tuning the effect to the song), but on the plus side now has separate Attack and Release envelope controls. Similarly, the Gate module now has a Smoothing parameter instead of a Length setting, which gives very different results. Small details like these mean that there are some improvements as well as some steps back. If you're hoping to retain the functionality of the original plugin, we recommend checking out the demo to see what it can and can't do. All that aside, though, Glitch 2 is a very capable and effective tool, whether you're using it to invoke the glitching for which it's intended, or just as an interesting multieffects processor.